Stairway and Ramp Accidents | Miami Slip & Fall Lawyers Gerson & Schwartz, P.A. Contact Miami Beach, Florida Personal Injury Attorneys Gerson & Schwartz, P.A. Changes in elevation create risks for young and old alike. Engineers and architects have known for decades that people subconsciously adjust their gait to the expected uniformity of stairways and ramps. Stairways and ramps present similar risks of harm in hotels, motels, apartments, and other commercial properties. Property owners, landlords, and other business operators always blame injury victims and insist that when someone is injured on their premises it is because they were negligent. We disagree. Many times, stairway and ramp accident cases are preventable but for negligent business operators. Under Florida premises liability laws, property owners, managers, and business operators are liable for injuries on their premises if surfaces fail to meet uniform building code laws and industry standards. Landlord and business owners are also required to keep their premises reasonably safe and ensure common areas such as walkways, ramps, and stairs are slip resistant. Handicap access must also be compliant pursuant to the American with Disabilities Act. Slope and lineal distance violations are can also be treacherous for children, elderly, and disabled persons. Gerson & Schwartz PA injury lawyers specialize in ramp, stairwell and other Florida premises liability accident cases where there are serious bodily injuries sustained. Since 1970, our law firm has represented injured victims in almost every conceivable stair and ramp accident claim. From slippery surfaces, non-conforming stair measurements, absent, loose, and defective handrail accident cases. Our attorneys have also received compensation for clients injured due to defective carpets, torn rugs, wet floors, broken steps, and traffic worn stair edges. Our injury attorneys have the experience to find the reasons why people fall even when they don't know themselves. 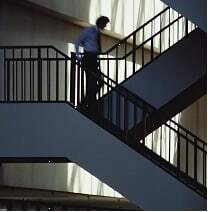 Uniform building codes provide standardized dimensions for stairs, treads and risers. These requirements are designed to make stairway and ramps slip resistant and to help prevent falls from occurring. Non slip treads, slip resistant paints, mats, and other safety precautions can be applied to stairways and their surfaces to help reduce falls, as well as proper cleaning, and maintenance. Dangerous thresholds, loose handrails, and inadequate slip resistance properties are common reasons why there are so many of these types of accidents in South Florida. If hired to represent you, we will consult with engineering, safety and medical experts as well as review local, state and federal building codes. We will also investigate to determine whether a property owner knew about or should have known an unsafe condition existed on their premises. In order to do this, we will thoroughly investigate the circumstances surrounding the accident and inspection of the premises. Our law firm is located in Miami, Florida. Our personal injury attorneys are also AV rated and have the type of legal experience you need to assist you. While you may not want to pursue a lawsuit, you have the right to seek financial compensation for your injuries if a property owner or business operator was negligent. If you have been injured in a stairway or ramp accident in Miami Dade, Fort Lauderdale, or another part of Miami, Florida contact us for a free consultation. Over the decades our firm has investigated and litigated on behalf of injury victims who slipped or tripped because of defects on these surfaces. We encourage you to proceed on stairways and ramps with caution. If you happen to trip and fall due to negligently maintained ramp or set of stairs you should seek treatment for your injuries immediately. In order to assist our clients, we obtain the advice of engineer and experts who can provide further evidence of a property owner's negligence. You should also take photographs, and obtain, when feasible, contact information of witnesses present when you fell. This information, along with your medical records, will help you bring a claim for compensation. We understand that falling down stairs or ramps can lead to significant injuries, which can lead to painful procedures and high medical expenses. If you or a loved one has been seriously injured in a stairway or ramp accident contact our law firm for a free consultation. We recover financial compensation for victims all across South Florida, including but not limited to Miami Dade, Broward, Fort Lauderdale, Aventura, West Palm Beach, and Boca. Compensation can be recovered for medical bills, rehabilitation costs, lost income and pain and suffering. There are no attorney's fees unless we collect money on your behalf. Call us at (305) 371-6000 or email us at info@gslawusa.com. Se Habla Español.